and has a feminine personality, and someone who is honest. Also for appearances I like (girls with) long hair, hopefully wavy long hair. For size...I hope she is somewhat taller past my shoulders, and I like clear and clean eyes.. and a girl who knows how to take care of herself / self disciplined. So, who is the lucky girl, YongHwa? Love! Love! Love! Everybody Clap! Clap! Clap! Let's make memorable memories in this new thread of uri YongSeo! 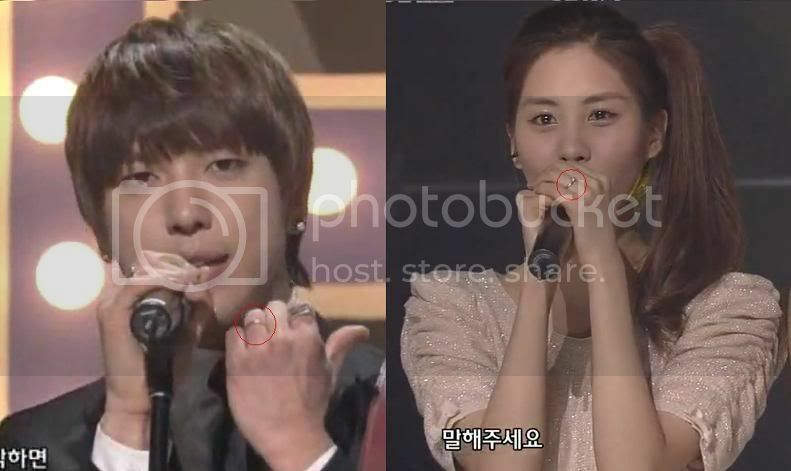 YongSeo Fighting! This is awsome this threat is already on is second page. I'm looking forward to details about the Thai concert and anyway anyone have information about links to the concert since is suppost to be broadcast in Korea and other countries. wow this is cool, i'm posting in new thread and i've never posted in new threads before especially one that reached 2000 pages. this is what i call a 'milestone'. this is daebak, leave all those sad memories behind and let's start a new chapter. Congratulations everyone for the new thread. you all guys did a good job!! can't wait for the updates from thailand and the episode later !! Can they put Seulong and Jinwoon as co-emcees since they have witnessed our couple’s story? Hope that SeoHyun would finally able to call her nampyeon ‘Yonghwa-yah!’. I am so happy that we have started our new thread!! Yes!!!! A new thread.... Congratulations to us!!!! I was worried that i will not be able to find the new thread!! But now i am here... A new home, a new beginning and its Saturday! I am beginning to feel like those bands that do multiple farewell tours and never retire but even though I said my goodbyes on the last thread, I wanted to say welcome on the new one. Just a thought, I am so sorry for the people new to Yongseo, that discovered them due to banmal song on you-tube or other sources and are just now getting to know them just as they are leaving the show. Watch all the episodes and then stay here and you can speculate, talk and spazz about them and there will always be someone to share your thoughts with you. Even after they leave the show there will always be news about them. Stay here and just get to know them and the wonderful people that populate this thread. And now another 90 degree bow to the translators, subbers, fanvid makers and fanfic writers, and all the posters. I love you all and wish only the best for all of you and hope that your dreams come true. I need to join in and spazz about the 2nd thread or else I'll miss my chance to do so when all the hype is gone....WOOT WOOT!!! all my goguma cinggus and familes.. Finally we got our second thread..
im so excited now waiting for banmal song duet and today's WGM episode.. its gonna be daebak..
Thailand goguma are so lucky..
you guys are so daebak!! i got teary look at the pictures and fancams..
i believe Yong and Hyun are happy and touched..
By the way, i think many gogumas are difficult to find this thread.. there are some of gogumas who still spazzing in old thread..
Last month I was seriously thinking of Booking a flight to THAILAND just for a Vacation.. If only I know Earlier that there would be an MBC Concert.. Wahhhh.. i should have reserved a ticket... Hmmmm.. nweiz.. I'll save money again and Wait for the REAL YONGSEO WEDDING.. I PROMISED I'LL FLY TO KOREA!!!!! is it Seychan who first thought of it??? hehehe.. I'll COme with you if that happens.. I SWEAR! Well this is really exciting my great aunt use to said that when one door closes a new window opens so lets have tons of fun spazzing In-Go Paem on our new Go-Chun. CAN ANYONE CONFIRM ABOUT THIS CHANGE IN BROADCAST TIME??? Let us celebrate this thread and our lovely couple!